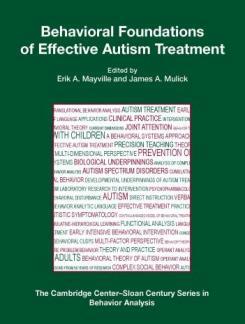 Behavioral Foundations of Effective Autism Treatment is a comprehensive volume of key topics in behavior analysis for individuals with Autism Spectrum Disorders (ASD). Consisting of 17 chapters by noted experts in clinical research, this book is an authoritative resource in helping students and clinicians understand and apply behavior analysis to a wide variety of ASD-related issues. The first section, "Theory and Conceptual Issues," provides behavioral conceptualizations of key issues and careful analyses of relevant learning processes. Specific topics include behavioral theories of autism, behavior analytic language and interventions for autism, verbal behavior, cumulative-hierarchical learning and behavioral cusps, joint attention, and complex social behavior. The second section, "Clinical Practice Issues," contains in-depth description of key clinical practice topics, including Early Intensive Behavioral Intervention, continuum-based education and treatment models, prevention and treatment of severe problem behavior, interventions for adolescents and adults with ASD, psychopharmacology and behavior analysis, Precision Teaching, and Direct Instruction.